In July 23, the 15th day of 2017 July Grand Sumo Tournament was held in Aichi Prefectural Gymnasium at Nagoya. On the day, there was a match of Yokozuna Hakuho vs. Yokozuna Harumafuji. Hakuho beat Harumafuji by “Yoritaoshi”, so Hakuho was 14 wins and he won 2017 July Grand Sumo Tournament. It was 39th victory of the tournament and 1,050th win that’s a new record in Grand Sumo Tournament. 2 day ago, there was a match of Hakuho vs. Ozeki Takayasu. Hakuho won Takayasu by “Oshitaoshi” that mean “pushing out”, so Hakuho got 1,048th win in the Grand Sumo Tournament. It was an equal record with Kaiou of former Ozeki. Then according to the news media in Japan, Yokozuna Hakuho will take up Japanese citizenship (by conferral). He is a Mongolian and wants to become the stable master after retirement. But only Japanese can became the stable master under the provisions of the Japan Sumo Association. 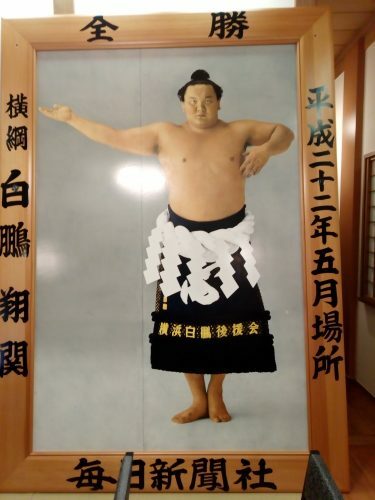 There are some sumo wrestlers who were naturalized to Japan and became the stable master (former Yokozuna Musashimaru, former Ozeki Kotooshu, etc). In addition, former Kyokutenho is one of the first Mongolian wrestlers, also has become a Japanese citizen after retirement and stable master Tomozuna. When did Hakuho think about naturalizing in Japan? That may be 10 years ago. In 2007, Hakuho married with Japanese woman (his wife Sayoko was a college student at the time) and had 3 daughters and a son. In fact the sumo wrestlers who were naturalized to Japan became the stable master in the past, all married with Japanese. In other words, when Hakuho married a Japanese, he would have planned to permanently stay in Japan in the future. Now he is scouting Ishiura of top division wrestler, Yamaguchi of second division wrestler and others, they will become sumo wrestlers of “Stable Hakuho” in the future. By the way former Kyokushuzan and former Yokozuna Asashoryu married with Mongolian, and after retirement they returned to Mongolia. Yokozuna Harumafuji and Kakuryu also married with Mongolian so they will return to Mongolia. Hakuho was talking about want to make his own stable in Ginza, Tokyo (the place likes New York’s Fifth Avenue), that dream may well come true. For the time being, his goal is to win 40 total victories and to be active in 2020 Tokyo Olympics. This photo is a portrait of the sumo tournament winner. Hakuho won 2010 May Grand Sumo Tournament and got this portrait. The size is about 3 meters in length and 2 meters in width. Previously this portrait was decorated at Ryogoku Kokugikan, but now it is donated to a temple in Kanagawa prefecture.